In their never-ending quest to dumb down Outlook’s interface, the folks at Microsoft has decided to get rid of yet another feature. 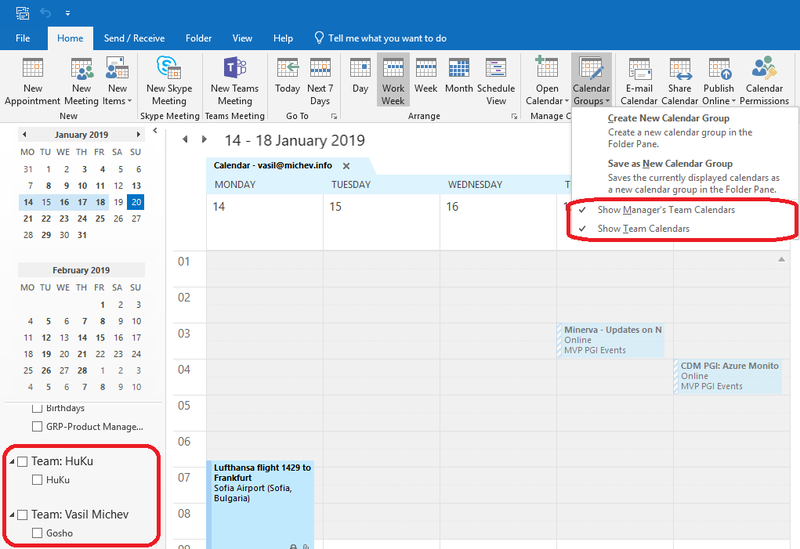 This time around, the impacted functionalities are the Team’s and Manager’s Calendar Groups in Outlook, or in other words the ability to quickly access all your direct reports’ or peers’ Calendars. While the semi-annual channel builds still feature these two functionalities, anyone using a current channel build will no longer have access to them. Once you toggle the settings, a new “group” will appear on the left pane, prefixed with “Team:” and featuring the name of the manager (or your name in case of direct reports). Under the calendar group, the individual calendars of each member of the team will be listed, up to a number of 100, allowing you to quickly select each on all of them, when needed. The feature itself doesn’t perform any changes (or checks) on the permissions on those calendars. In all fairness, we haven’t lost the functionality to actually open the Calendars of any of our peers or direct reports, provided the corresponding permissions allow it. What we’ve lost is access to these two toggles, which made the process that much easier. Then again, in larger teams they could contribute to creating a “calendar bloat”, or create confusion in situations where the permissions didn’t match the intended use case for this feature. Still, people have been using these settings and were caught off guard by their removal, as evident for example from this thread on the MTC. In addition, the feature relied on having the Manager attribute properly configured in AD/Exchange Online, which isn’t always the case. For example, two years back when Microsoft decided to shove the “Auto creation of Direct reports Office 365 Groups” down our throats, Tony Redmond was quick to point out that roughly half of the Exchange Online users covered by Cogmotive/Radar reports do not have this property configured. This entry was posted in Exchange Online, Office 365, Outlook. Bookmark the permalink.